Forgive me dear readers for getting out of sequence, I am writing here about Brussels, Belgium and well, based on the timeline of the blog, we haven’t gotten here yet. I am about five days behind real time, but after a bottle of wine with dinner, so be it. Jeannie and I have two different ways of looking at things … duh. These two images kind of say it all. One is of her purchase of high quality, expensive, Belgian chocolate. There are chocolate shops on every street, LOTS of chocolate shops. 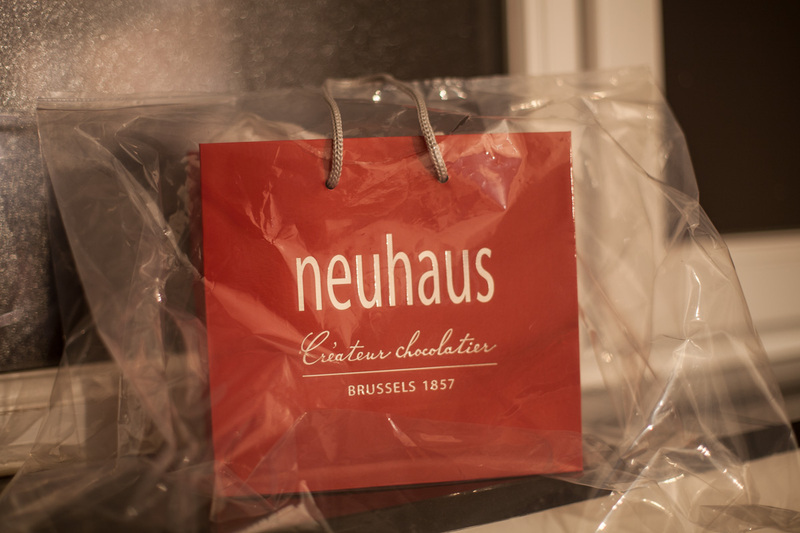 But Neuhaus is supposed to be some of the best. Not only is it boxed, and in a fashionable bag, since it was raining they place it in its own raincoat. Jeannie assures me that the chocolate is indeed excellent. I don’t know, I haven’t had any … I drank wine … tonight. On the other hand, the other image is of two empty beer bottles. This is the best beer I have EVER tasted. (thanks to Muriel at the Fin de Siecle restaurant). 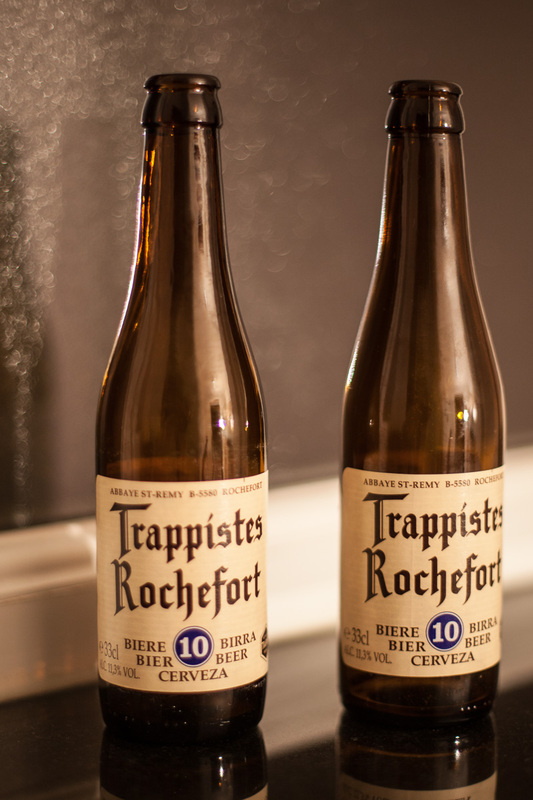 This beer is brewed inside the Abbey of Notre-Dame de Saint-Rémy, near the town of Rochefort, where they have been brewing beer since 1595. There are approximately 15 monks resident at the monastery. As with all other Trappist breweries, the beer is only sold in order to financially support the monastery and some other charitable causes. So, not ONLY is this beer great, drinking it is for a good cause! So, even though we are walking 5-10 miles (8-16 km) per day, we still have to watch our calories. We just do it differently. I Love Chocolate! I’m on your side on this one Jeannie! Hmmmm, although a good brew is hard to turn down. Ahh decisions, decisions……. Thanks for your support and encouragement. Just to know that it is enjoyed is reason enough to express the feelings of the place and photograph all that I see. Merci bien. I just love you guys. Hehehehe. Brewing beer since 1595? That trumps any designer chocolate I’ve ever eaten. But I DO love chocolate. Hehehehe. Seems to me like you should be drinking wine while munching on chocolat. Good to hear fro you today. I figured the photographs out. Well, you might try only buying chocolate when the sun is shining. Ha ha ha ha ha ! I side with Chris on this one. By the way, this is where reading about your adventures falls so very short of being there with you to experience it.